Tiny Prints is having a 25% OFF SITEWIDE SALE through next Tuesday! Save 25% Off Everything (excluding Erin Condren weekly planners, greeting cards, gift cards, gift certificates, calendars or photo books), from now till Tuesday October 2. Offer expires 10/2/12 at 11:59 pm (PT). Use code: SEPT25 during checkout. 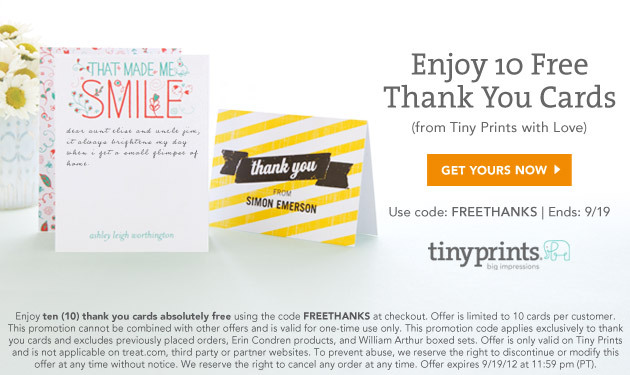 This is a great opportunity to save on Halloween and Thanksgiving invitations and stationery. Don't miss out! Save on 120+ must-haves for your fall wedding reception, now on sale up to 60% OFF! Give a perfect memento of autumn with our Fall Impressions Glass Photo Coasters, now on sale only $1.49/set of 2. Find great deals on favors, decor, chocolates, personalized napkins and more in the sale category. * Sale prices and coupon savings valid through Sunday, September 30th. Free Ground Shipping applies automatically to qualifying orders ($149 or more before tax and shipping). The folks at American Bridal marked down best sellers sitewide--up to 60% OFF! Prep your groomsmen for a guy's trip with their top-selling Embroidered Weekender Bag, only $18.95 with FREE personalization. Find great deals on favors, attendant gifts and more in their sale category. * Sale prices and coupon savings valid through Sunday, September 23rd. Free Ground Shipping applies automatically to qualifying orders ($149 or more before tax and shipping). Shop a huge selection of totes for your bridesmaids gifts, now up to 80% OFF! These chic Solid Box Tote comes embroidered with her first initial with your choice of bag and thread colors, now a steal at only $18.95. Find great deals on more totes, many with FREE personalization, in the sale category. * Sale prices and coupon savings valid through Sunday, September 16th. Free Ground Shipping applies automatically to qualifying orders ($149 or more before tax and shipping). Make your reception unique with decor and favors up to 50% OFF! Stock up on top-selling Personalized Beverage Wedding Napkins, now a steal at only $17.95/100. Find great deals on all personalized napkins, edible favors, personalized matches, fans, coasters, cake serving sets and more in the sale category. * Sale prices and coupon savings valid through Sunday, September 9th. Free Ground Shipping applies automatically to qualifying orders ($149 or more before tax and shipping).